Aerotel Medical Systems will present new innovative and affordable personal Mobile Health (mHealth) solutions at the ATA 2010 conference, which will take place in San Antonio, Texas USA on May 16-18, 2010. Aerotel will use the three day expo to demonstrate its Mobile-CliniQ, a mobile phone application that enables remote monitoring of various health parameters, such as electrocardiogram (ECG), blood pressure, blood glucose level, weight, etc. This and other solutions, including e-CliniQ homecare, and other advanced telemedicine and telecare systems, will be presented by Ofer Atzmon, VP Business Development and Marketing, at Aerotel's Booth 825 at the Henry B. Gonzalez Convention Center. ATA 2010 is the world’s largest international meeting and tradeshow, which is focusing exclusively on telemedicine and telehealth. It is organized by The American Telemedicine Association and is aimed at answering growing public demand for telemedicine, which is now widely recognized as an integral part of modern quality healthcare. With the spreading usage of smart phones, Web applications, remote monitoring devices and social media, a growing number of patients are using these tools to improve their own healthcare. 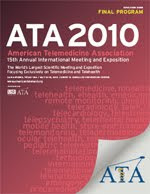 At the ATA 2010, the advantages of telemedicine will be exposed in educational sessions, professional networking and access to vendors. The general sessions at ATA 2010 feature insightful keynotes, including Aneesh Chopra, Federal Chief Technology Officer of the United States, MG James K. Gilman, Commanding General, US Army Medical Research, and Materiel Command and Fort Detrick, and John P. Howe, President & CEO of the international health foundation, Project HOPE.